This prototype. AE17. 5:00. 2.92 grams. 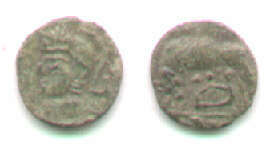 Mint of Antioch. 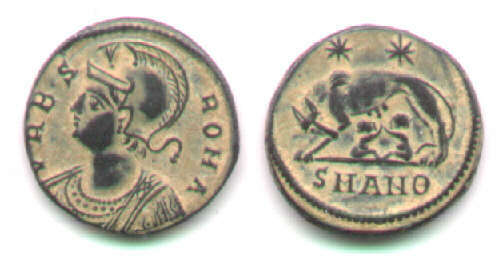 VRBS ROMA, Roma facing left in plumed helmet/Wolf left, head back, suckling the twins Romulus and Remus, two stars (usually assumed to represent the Dioscuri) above. 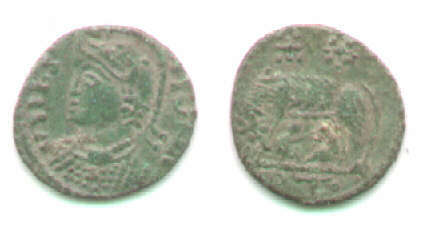 Mintmark in exergue. This prototype was extensively imitated in the west, especially in Britain. Small and ill-made pieces exist by the thousands. Many show the distinctive green patina (or ugly corrosion) of English soil. Few are sharply struck and well-centered. A pleasing barbarous VRBS ROMA would be a prize. The examples below were (probably) all found in England. I believe the vast majority of VRBS ROMA imitations are from England, but the selection below may be biased because of my sources. However, I am not aware of eastern hoards having such imitations. 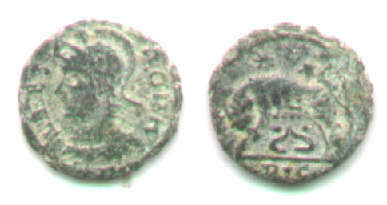 The CONSTANTINOPOLIS page has three imitations found in a hoard of perhaps 1000 official pieces which was probably found in the Balkans, but that percentage is extremely small compared to the fraction of imitations in English groups. /in exergue, only the final letter "C" is clear. Most imitations are AE15 or less. Next is a very small one remarkable for its centering. Another small PLG (Lugdunum) piece. The die size fits the small flan size and the style and execution are excellent. Did Lugdunum issue such small pieces officially? I think not. If so, it was the only mint to do so (a few small TRP coins notwithstanding). With hesitation, I assume that this is just an excellent imitation. Six VRBS ROMA imitations, AE14-12. You have just finished page 2 of 4 of this group. Continue with the page on CONSTANTINOPOLIS imitations (page 3 of this group). Skip ahead to the page on imitations from AD 340-348.